We didn't have to wait long after Valencia's announcement of planned re-launch of Nou Mestalla construction. 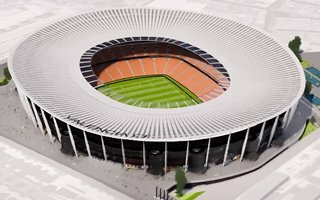 First rendering and a short video clip were released by the club yesterday, showing a completely redefined concept of how the stadium will look. Most importantly, the vision has been drawn, contrary to 2015 reporting, by the same architects of Fenwick Iribarren. However, its architecture is fundamentally different. Downscaled significantly and without an opaque facade, the stadium's concrete structure will be clad with mesh, glass and composites, which is much cheaper than a more elaborate form of cladding envisioned in 2006 and 2013. To further cut costs, the stadium will also see its capacity decrease once more. As a reminder, the original design proposed a 75,000-seater, later cut to some 61,500 in 2013. Now Mark Fenwick himself suggests it's going to be within the 50,000-60,000 range, prompting media narrative of 55,000 capacity goal. This would put the stadium just above current Mestalla, though of course in terms of floor space and infrastructure the two would be worlds apart. The capacity issue has already caused quite some debate because the main concrete structure is already in place to be filled with 75,000 seats. Is it going to be retained and parts unused, simply waiting for demand to grow? Details on that are expected soon. For now we dare to speculate that parts of the top tier will be dismantled in the new design, which will reduce the stadium's height and facilitate building a canopy above it. Also unclear is how the bottom tier should change. It's been confirmed by Valencia that fans will be brought closer to the action than the current seating bowl allows, though it won't happen via the field being lowered. How, then? This is also up for further announcement. To further reduce the stadium's cost, its new roof has been designed from scratch, as a completely independent structure instead of being kept in place by the concrete superstructure. It's going to be a lightweight and material-efficient tensile cable canopy, which, in our eyes, makes a beautiful topping to a very rational concept. This new recipe for a happy end to the Nou Mestalla telenovela is speculated to cost just €100 million. For a megaproject that's been abandoned for 8 years now, that's a very good price tag, regardless of the €150 million already having been spent. As announced earlier this week, the stadium should be ready for opening in May of 2021, though exact date of its construction resuming is unclear as of now.